Pew Research has tracked vote preference among different age cohorts in the past several presidential and midterm elections and looked at who was president when each cohort turned 18. Does the person who is in the White House when people come of age affect their long-term political leanings? By looking at likely voters from our pre-election surveys, we can see how each age cohort voted relative to the national average. In some earlier elections that we tracked, likely voters from that cohort leaned somewhat more Democratic. But in every election since 2000, those who came of age under Kennedy and Johnson have either voted more Republican or about the same as the rest of the country. That’s not to say these voters are as Republican as those in the Silent generation, who came of age under Dwight Eisenhower and Harry Truman — those cohorts vote much more Republican than the rest of the electorate. Likewise, those who turned 18 in the Gerald Ford-Jimmy Carter or Ronald Reagan-George H.W. Bush years also have voted consistently more Republican in the last several elections. In fact, it’s the Nixon-era’s 18-year-olds, who were born in the middle of the Baby Boom and were ages 56-61 last election, who are more Democratic-leaning. In 2012, their margin of support for Obama exceeded the national average by 5 points. Democrats also get a lot of their voting strength today from adults who turned 18 during the Bill Clinton years or after. Adults who came of age under Clinton (who were 30-37 in 2012) favored Obama by 13 points – 10 points higher than the national average. 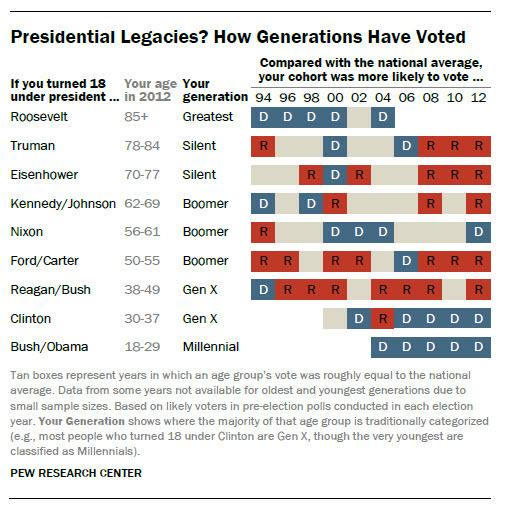 The most Democratic cohort is the generation who turned 18 under George W. Bush or Obama. 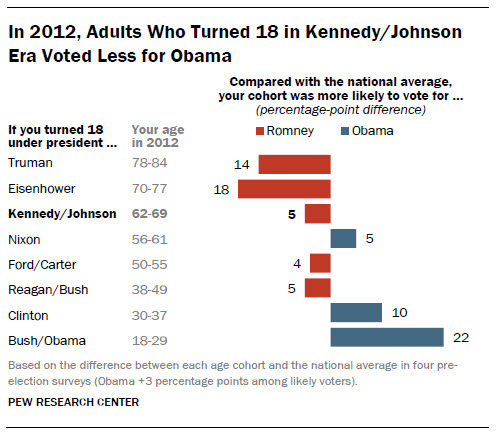 These voters, who were 18-29 in 2012, favored Obama by 22 points more than the rest of the country. Time will tell if these younger generations keep their voting patterns as they age. On the one hand, the Greatest generation that came of age under Franklin Roosevelt remained reliably Democratic-leaning throughout their lives. But as the Kennedy-Johnson generation shows, 50 years can change a lot.